ORLANDO, FLORIDA April 2, 2013. The Water Sports Industry Association (WSIA) has announced approval of the first International Safety Standard for the Parasail Industry – F2993-­‐13 Standard Guide for Monitoring Weather Conditions for Safe Parasail Operation. As the official association for parasailing, the WSIA was contacted in 2010 by the United States Coast Guard asking WSIA to support an effort to produce Parasail Operator Standards using the highly acclaimed ASTM International for the process. The Coast Guard explained that if the parasail industry did not regulate itself, the Coast Guard would be forced to create regulations. To facilitate the process WSIA created the Parasail Operators Symposium, an event held at Surf Expo in Orlando, Florida. The WSIA invited the USCG, the FAA, Florida Fish & Wildlife Commission and all parasail operators to participate in the event created to develop standards. Led by ASTM International the consensus building process was explained to the more than 150 owner/operators who attended each year. It is reasonable to understand that the process confused many and some were even skeptical about the motives but with encouragement from the U.S. Coast Guard the group pressed on. The majority agreed that the most common cause of accidents during a parasailing activity was related to weather, so the need for a weather standard was given first priority. Over the past 18 months, ASTM International hosted many teleconferences. The teleconferences were open to anyone that wished to participate. Membership to any organization was not required. The ASTM International process welcomes input from all interested parties. With the help and leadership of Lt. Cmdr. John Taylor of the U.S. Coast Guard, common ground began to develop and by November it became obvious the process was on the right path. The first ASTM International Weather Standard for Parasail Operators was approved on April 1, 2013. F2993 is undergoing its final formatting and it is anticipated that this document will be published and publically available later this month. Once published, a copy of the ASTM International Weather Standard for parasailing can be obtained at http://www.astm.org. For more information on the Parasail Operators Weather Standard, please call WSIA at 407-­‐251-­‐9039. About the Water Sports Industry Association: The WSIA’s mission is to serve as the world’s leading trade association that promotes and protects towed water sports activities. 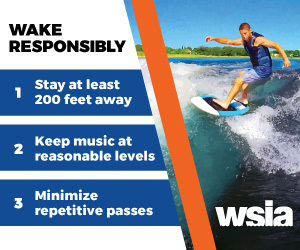 WSIA is the leading advocate that communicates, produces and distributes water sports safety and educational materials. The WSIA works with local, state and federal agencies in partnership with national and international governing bodies to ensure the use of waterways for water sports. Meeting three times per year, the WSIA Board of Directors is represented by every major towboat, waterski, wakeboard, accessory manufacturer, media-­‐provider and engine brand – 27 in all. For more information please contact the WSIA at 407-­‐251-­‐9039 or visit www.WSIA.net.